First, some history. Temple Bar has always been a popular spot – the Vikings set up camp here as far back as 795 A.D. Their settlement remains can be seen in Dublin Castle today. 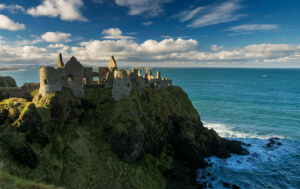 Fast forward a few centuries to a time when British diplomat Sir William Temple built his grand residence and gardens on the site, the name stuck and Temple Bar was born. The Temple Bar area is a square on the south bank of the River Liffey with off-shooting streets and narrow laneways. They’re lined with boutiques, cafes, galleries and pubs, and at any time of year, packed with culture-vultures and party-seekers. It’s the city’s playground, and it has a lot going on. Temple Bar is the centre of Dublin’s cultural universe. 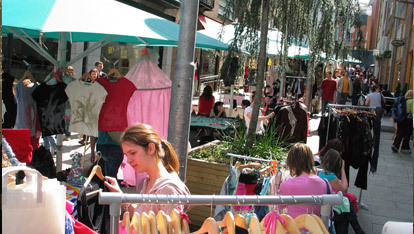 Buskers, street artists, open air markets and exhibitions a create carnival atmosphere. You can catch a show (no less than three theatres on offer), mosey through a gallery, explore a market, go to a gig or just plonk yourself in a café for Dublin’s best people-watching spot. 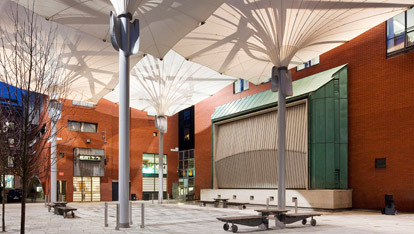 Meeting House Square is Temple Bar’s culture HQ. It is lined by The National Photographic Archive and The Gallery of Photography (both free entry), and the Irish Film Institute. It is also a stage for occasional screenings, markets and even a vineyard. Every Saturday, it erupts with colour with the food market. Huge canopies cover the square making it all-weather. 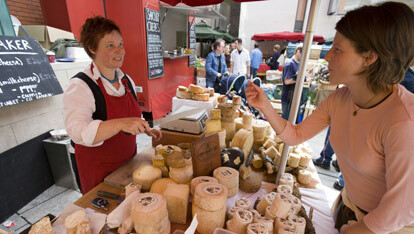 On sale you’ll find fresh fruit and veg, a cheesemongers, even oysters. Around the corner in the main square, the Temple Bar Book Market has a world of literature on its stalls. 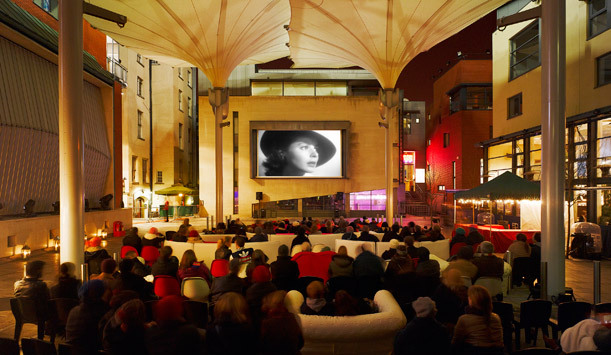 Between the squares is Filmbase, a mecca for film fans with a public gallery, tasty café, free lectures and screenings. Feeling peckish? Wander the cobbled streets and let your sense of smell guide you. The fare on offer is international, from Indonesian eatery The Chameleon to French bistro Les Fréres Jacques. For traditional Irish, get your boxty on at Gallagher’s Boxty House. For a real treat, try the Tea Room restaurant at The Clarence Hotel, and keep an eye out for owners Bono and The Edge. When the sun goes down, the volume goes up. Temple Bar has the highest density of pubs of in Dublin City, so no problems grabbing a pint here. Street musicians play their hearts out for the revellers hopping from pub to pub. The rhythmic sounds of Irish trad music may tempt you in for a pint and a dance. 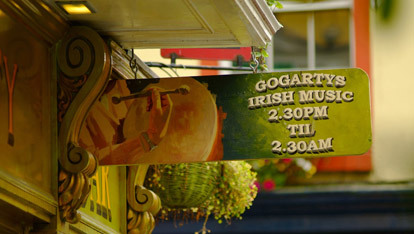 The Oliver St John Gogarty bar has live Irish trad every day and night. Down Fleet St, is The Porterhouse Bar and brewery pub. One of the bastions of Ireland’s craft beer scene, The Porterhouse’s taps only flow with their brews, and there are bottled wonders from around the world. Quite like Temple Bar itself: a cultural melting pot with an Irish flavour at its heart.